Meet Simone. 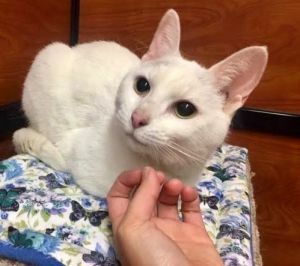 She is a 6 year old, all-white female kitty with a little spot of gray on her head. We think the gray spot adds character to her chiseled face. Simone is very delicate looking with shiny green eyes and a cute pink nose. She is a TOTAL LOVE who gives HEAD BUTTS and is very TALKATIVE. She's EASY TO HANDLE also. Simone previously lived with a big dog and was fine with him. She actually LOVES dogs! Look at the photo of her HEADBUTTING a dog. She's a bit cautious with children, so we are wondering if perhaps she had a bad experience with them. Simone is available for “Meet and Greets” in Long Beach. NY. She is spayed, UTD on shots, and FIV/FeLV negative. WATCH MY VIDEO!! !